The Kingston Frontenacs and Sarnia Sting of the Ontario Hockey League have made several trades in recent history. The two teams went head-to-head at the K-Rock center in Kingston on Sunday, and it provided an excellent opportunity to analyze the impact of the trades. Last season the Frontenacs traded fourth year centreman Charles Sarault for a third, and sixth round draft choice in the 2013, and 2015 drafts respectively. Prior to the OHL trade deadline this season Sarnia loaded up on two more former Frontenac players, leading scorer and overage team Captain Tyler Brown, and star center Ryan Spooner. Kingston General Manager Doug Gilmour received Jack Nevins and a third round choice for Brown, and former first round selection Ryan Kujawinski in exchange for Spooner. In his three seasons in Kingston, Sarault produced nine, 16, and 38 point totals. This season in Sarnia, Sarault has 67 points in 48 games and leads the league with 52 assists, a far cry from his modest production in Kingston. During the game, I had a chance to speak with Sarnia Assistant General Manager Mark Glavin. I asked Glavin about Saraults break out season and if they were surprised, or saw this as a possibility. “We liked him, and that’s why we acquired him. Sometimes you just need an opportunity, and he got that here.” Sarault played on a line with fellow Frontenac Spooner, and the consensus number one overall pick at the upcoming NHL draft, Nail Yakupov. Sarnia wins this trade and should be commended for identifying the potential. Sarault was not drafted into the NHL, and as a result has the potential to return for one more season of Junior as an over-age player. Sarnia GM Jacques Beaulieu’s acquisition of Tyler Brown will provide the Sting with leadership. 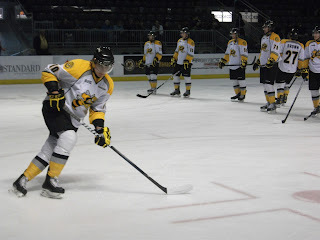 The former Frontenac Captain now is an Alternate with Sarnia. Beaulieu acquired Brown for his leadership saying “Brown and I have a relationship because I coached him in London, so I know what he’s all about. He’s full of character.” Brown is precisely the type of character who can help lead a team to a championship. While Kingston parts with their Captain and leader, the last place Frontenacs were in no way going to contend for a championship and felt it best to give Brown the opportunity to win. As an over-age, Brown’s junior career will end at the conclusion of this season. Gilmour received 19 year old Jack Nevins, who is 6’2” and weighs 212 lbs. “Nevins brings us some toughness and grit” Said Coach Todd gill. Nevins has a team leading 72 penalty minutes and will likely be back next season. Time will tell how these trades end up paying off for both teams. If Sarnia is able to win a championship, or compete for the memorial cup with their star powered offense they will be pleased. How will they youth developed in Kingston and will all the draft picks acquired be used wisely. It is of course too soon to tell but for now it appears as if both teams got exactly what they wanted to achieve their goals. Posted by pharling at 3:22 p.m.